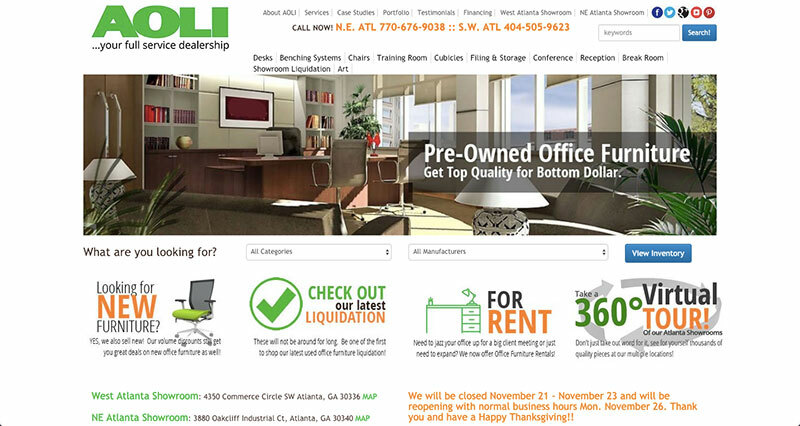 Atlanta Office Liquidators, Inc (AOLI) is one of the top office furniture retailers in the South East. With two showrooms located in Atlanta, they offer an outstanding amount of quality new and pre-owned office furniture. AOLI has been a long-time client of ours, so redesigning their website was a very involved process. Every decision was made to enhance their on-going marketing efforts while also bringing the design up to current trends and standards. 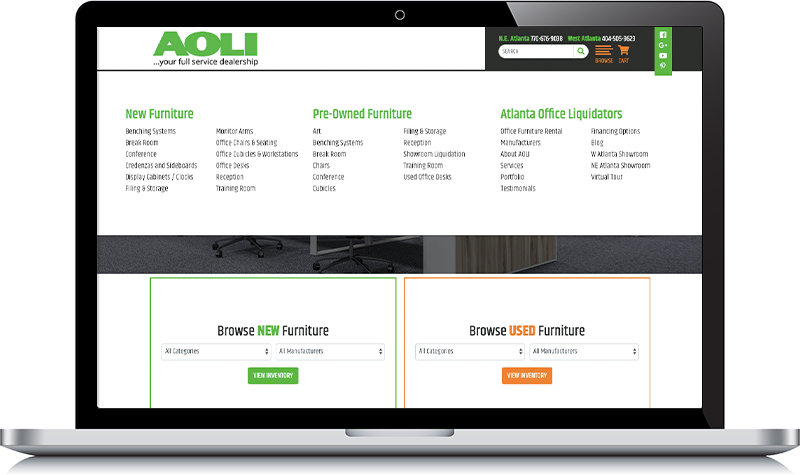 One of the primary goals for the new AOLI site was to make it easier for visitors to find the type of office furniture they’re looking for. So, in addition to having a search bar in the header where visitors can search for products using keywords, we organized the header navigation into a dropdown mega menu. Within the menu are three sections. 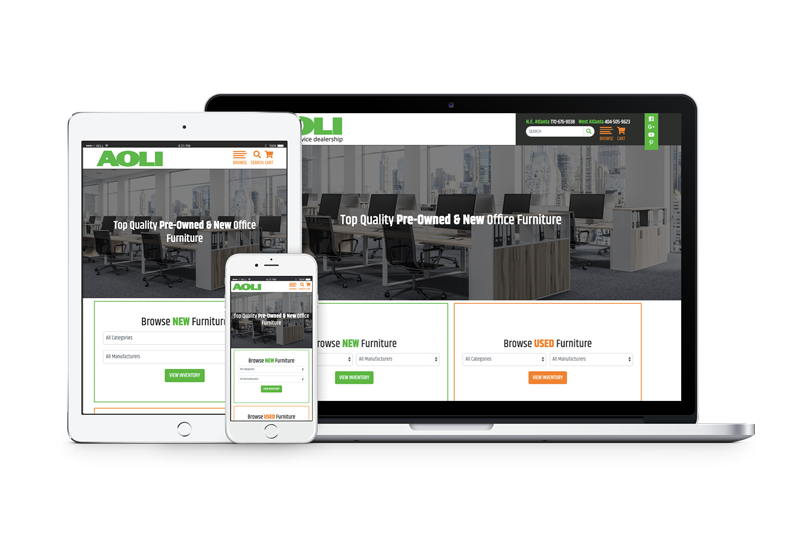 The first section displays the different categories of new office furniture, the second shows the categories for used office furniture, and the third displays other pages that provide more information about AOLI. On the home page, we place two boxes containing a category and manufacture filter for both new and used furniture. This feature allows visitors to filter their search by the furniture type, the brand that makes the product, and its condition. Below the search function are three buttons that take visitors to view sale items, furniture for rent, and AOLI’s portfolio. 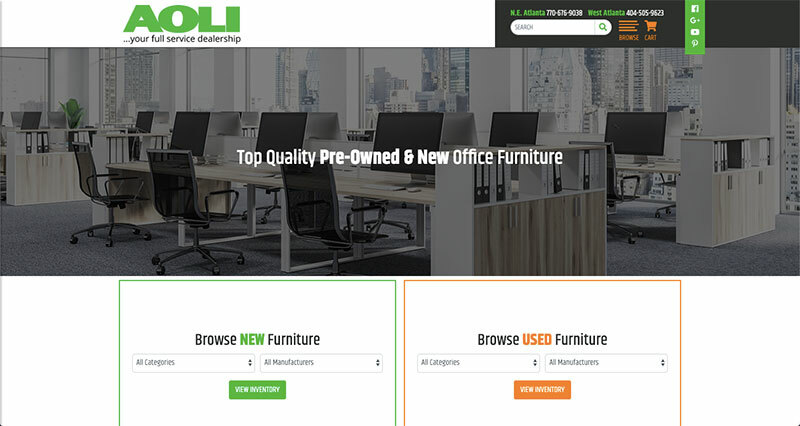 On the product category pages, visitors can see all the furniture AOLI offers for a given category. From there, visitors can go to individual product pages to view additional images, read the product description, and request a quote. Users can also save products to their cart, allowing them to easily request price quotes for multiple products at the same time. 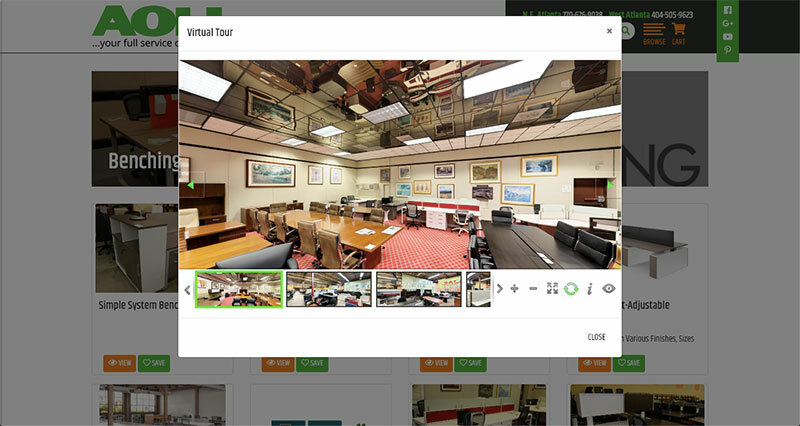 Another great feature on the site is the Virtual Tour popup. This opens a window that shows users a 360-degree view of various showrooms at their locations. The new AOLI site was built on the Expression Engine content management system (CMS). This CMS allows the AOLI team to easily add and edit products on their site. Additionally, it tracks their many contact requests and quote submissions. The site also uses responsive design, so it automatically resizes to fit on any device.